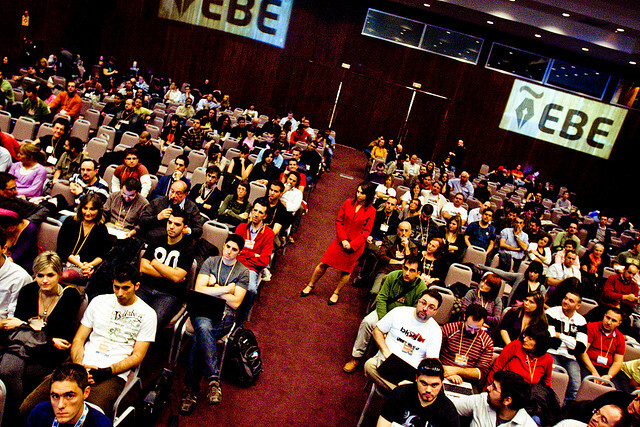 EBE is the major social web meeting point in the Spanish speaking world. The reference meeting for web lovers and professionals. What makes it unique? The thrill for making and sharing the future, Seville during the weekend and the bonds within the community that is active all year round. We are hoping to gather 2,500 people. We’ll get together at #EBE12 on November 2nd, 3rd and 4th at the Convention Centre of Hotel Barceló Renacimiento – Centro de Convenciones del Hotel Barceló Renacimiento (Isla de la Cartuja s/n, Sevilla). Registrations will open in September and 3,000 places will be put up for the taking. Attendance will be paid again: 15 euros. If you’re coming from outside Madrid and need a hotel, you can arrange for it with us. We have prepared an entrance+lodging pack in a hotel at a previously negotiated price in order to make it more economic for EBE attendants. We have made reservations of almost 100% of the rooms, so if you decide to stay there you won’t have any problems. You will need only to select that option when you buy your ticket in September. And just like that you’ll be saving time in travelling and gaining in comfort. You will provide you with details on how to do it. As usual, there will be a discount for RENFE tickets. A bigger number of attendants implies a bigger content segmentation. We are putting effort into improving the programme for the different audience we have. We will continue with a parallel programme in 4 different spaces where we will differentiate major conferences, niche talks, workshops and a networking area with its own programme. EBE is, by excellence, the annual social web meeting point in Spain, although it goes beyond just that. Its relation with the community is present all year round and culminates in autumn as a meeting point for fans of everything that stands for exchange in the Internet and the technologies that revolve around that. Above all else, its attendants share their passion for innovation and for the future, representing at the same time a market niche of great influence and relevance for companies, given their power to shape opinions. In 2011, EBE reinstated its position as the major social web call of the Spanish speaking world and second in Europe in attendance, a line we will continue to develop in 2012 with the participation and presence of leaders and invited countries from these geographic areas, in a process of growing internationalization started in the last editions. One of the differentiating characteristics of EBE is its ability to conciliate a rich and interesting environment that is at the same time informal, conducive to creativity and talent. The EBE website. This year we celebrate EBE again at the Convention Centre of Hotel Barceló in Seville (Centro de Convenciones del Hotel Barceló), which constitutes somewhat of a coming back home. EBE12 will be celebrated on the weekend of 2nd, 3rd and 4th of November. We maintain faithful to our meeting in autumn. This year EBE will again have a symbolic price: 15 euros. We will continue to grow. After the 2,100 attendants last year, this year we want to fill 2,500 places. For registrations we’ll free up 3,000 places, which is our maximum capacity. Talent zone. We rethought the networking area so as to give it more content and connect work, talent and experiences with meetings and different gathering formats. We took inspiration from some other formats as “speed dating”, “hackathon” and “open spaces”. We maintained the relation of EBE with the city of Seville. EBE is a synonym of Seville and it would not be the same in any other part of Spain. This is what the attendants themselves tell us, and we will continue to search for more activities that make the city even more of a protagonist. Bigger focus on the leisure, fun and entertainment area with big impact activities. EBE is about knowledge but also about people who get together once a year. Our veteran attendants don’t need to come accompanied to EBE, they know this is a must go event for many and that they will meet plenty of known faces there. EBE in English. We want to continue to increase the number of conferences in English and have one other European country as a guest. Streaming will still be an important point. Last year we surpassed the 20,000 views. Twitter is one of our strong features. EBE is, by excellence, the event to follow on twitter in Spanish. There is no other event, nor in Spain, nor internationally (LeWeb, DLD, MWX…) that generates as much hype for so many months. The #EBE11 tag tweets reached, in the 3 days of the congress alone, 55,392,713 page impressions. Yes, 55 million page impressions in only 3 days. If one considers the number of tweets during the celebrating weekend, the #EBE11 tag appeared in 32,050 tweets. 5,034 users tweeted #EBE11. If we add the remaining tags of the sessions, we reach 49,000 tweets and 61 million page impressions. All the data in the Pirendo report (informe de Pirendo). Listen to the people. The attendants make EBE. This year, more than ever, we will open the programme to those who help us decide which contents we may lack. Through the web and our twitter channel we will be requesting help from our community to define our contents. We are convinced that by taking into consideration their opinions, we will keep improving. We want EBE to be even better this year. We like to overcome ourselves and try to do it better every year. We have taken a long look at what you thought was the best and the worst of EBE, #lomejordeEBE and #lopeordeEBE, respectively, and made notes of some of our EBE11 conclusions – algunas de nuestra conclusiones de EBE11. If there is anything you’d like to point out you are more than welcome to do so; it helps us think about what we are doing wrong in order to correct it and understand what you prefer in order to reinforce it. Moreover, remember we always accept and appreciate suggestions through #charlaEBE and we are always listening to our account on Twitter (@ebe). The point of EBE conferences is to satisfy to the maximum the variety of interests that are brought upon by the wide audience that attends every year. The presence of a big part of the audience is connected in EBE12 to segmentation. As such, we have made a point that all attendants have plenty of options to choose from, according to the topics that interest them the most. The EBE sessions will generally have a brief duration and a quick, dynamic and participative format. We will continue to improve the programme for the different audience we have. As such, we will continue with a parallel programme in 4 different spaces where we will differentiate major conferences, niche talks, workshops and a networking area with its own programme that is a novelty this year. Every year our programming is very much related with the pulse of the Internet sector and related technologies and also with the contribution and participation of the people. We are drawing up the programme in detail but we can disclose some of the topics to be presented at EBE. We want to discuss design, productivity, organization, trends, fashion, journalism, new products, the new app economy, shopping and making payments with cell phones, new social networks with new functionalities, social media, new forms of online marketing, new forms of cultural productivity, education and technology, etc. Have we left out anything important? Give us a hint and we’ll set about it. The demand to attend and customer loyalty proceed growing at a soaring rhythm. In 2009 more than 1,000 people were left out because of capacity problems. In 2007, we obtained 700 registrations in only 4 months. In 2008, those 600 registrations were taken in 11 days closing the registration at 1,045 people. In 2009, the 1,500 registrations were taken in 9 hours! In 2010, the registration period started in September and the 2,500 vacancies ran out in 8 hours. In 80 minutes they were completed: 1,500. In 2011, EBE was paid for the first time and we surpassed the 1,800 attendants. Esto es EBE / This is EBE from EBE on Vimeo. What will you do at EBE? ¿Qué vas hacer en el EBE? from EBE on Vimeo. EBE 5th Anniversary 5º Aniversario de EBE from EBE on Vimeo.